How is Organic Milk processed? Pasteurization – This stage requires heating the milk enough so as to rid the milk of dangerous microorganisms. This also allows for longer shelf life for the organic milk. An alternative to normal pasteurization is Ultra-pasteurization (UHT- Ultra-high temperature). In this process, the milk is pasteurized at a higher temperature to make it sterile. The milk is usually heated to 280 degrees for at least two seconds. UHT milk can be packaged in containers that will keep it safe without the need to refrigerate. The shelf life can be up to 60 days. There is a lot of controversy about the effects of UHT on organic milk. We will cover this topic at a later date. Homogenization – This process prevents the separation of the milk fat and the milk. The result is a silky smooth texture. 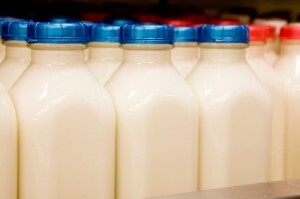 Organic milks are available in both homogenized and non-homogenized (cream on top). Fortification – During the first two stages the milk loses some nutrients, so this process adds certain vitamins back into the milk. Vitamins A and D are commonly added.